The Salvation Army Outreach Team is committed to creating life transforming opportunities. Poverty, homelessness, addictions and mental health challenges are harsh realities for many in our community. From our office or under the overpasses, our Outreach Team comes alongside those living in difficult circumstances, offering hope and the support necessary to equip individuals to overcome the challenges that stand in their way. The Salvation Army’s Social Services encompass a wide range of programs to help individuals and families overcome daunting obstacles. 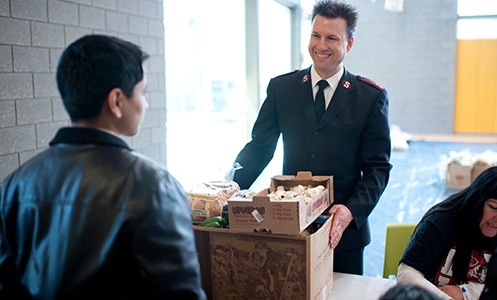 Motivated by the love of God, as a leader in Christian faith-based human services, The Salvation Army is committed to serve the whole person, body, mind and spirit, with integrity, respect and dignity. Through innovative programming, advocacy and valuable partnerships, The Outreach & Family Services Teams have been able to connect people with the right resources and support services to get dozens of them out of desperate situations and into a home of their own. The Salvation Army Outreach Team is the recipient of an Abbotsford Business Excellence Award, and an additional nomination, in the Social Responsibility category for their work with the homeless in our community.